Living the good life is a timeless quest—and Blue Palace is a classic in the making. In ancient times, the Minoan kings ruled in splendor from their palace in Knossos. These days, visitors seeking hedonistic pleasures find the royal treatment a few miles away at Blue Palace, on Crete's rocky northern coast. 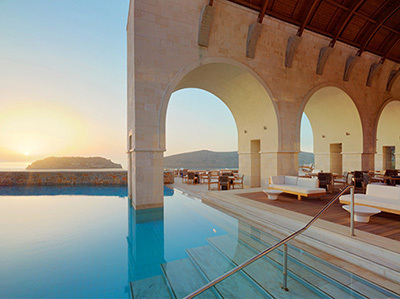 Blue Palace has remained close to its roots architecturally; the breathtaking, soaring arched lobby mimics the old shipyard in Heraklion, and all the buildings are crafted from local stone. It also pays homage to its surroundings; none of the spacious and secluded bungalows, suites, or villas is more than two stories high, blending effortlessly into the sun-touched landscape. All have inviting balconies or terraces with sea views, and more than half have their own infinity pools that make you feel you could simply swim off into Mirabello Bay and the Mediterranean beyond. The understated decor--blending Greek, Arab, Turkish, and Venetian elements--reflects Crete's multilayered history. Amenities range from satin sheets and satellite TV in the rooms to several gourmet restaurants, reflecting an unwavering commitment to the most modern of comforts. The Spa at Blue Palace gives testimony to the restorative powers of the fresh, pure seawater at its feet. You can indulge in hydromassage baths, algae body wraps, olive oil and raki cures, heated seawater pools, and saunas and steam baths. For the ultimate experience, what about reserving the Grand Villa, with its own Jacuzzi®, sauna, and indoor and outdoor pools, and having your treatments of choice in the private massage area? The Minoans, the sophisticates of their day, would certainly have approved.